When it comes to applying stickers on my scooter I'm very particular! The stickers have to have some meaning or resonance to me; in that I have a connection to the company/dealer, the club/place they represent or the individual who gave me them. They are only permitted on the legshield toolbox too! The stickers must look good, not overly large and for me, not square or rectangular - I like a round, oval or script sticker and of course the colours have to harmonise with my Motovespa's orange paint - it's all in the details! Horses for courses/each to their own etc. Maskes Vespa Klassiekers, SIP Scootershop, Hola Vespa, and ScooterNova magazine are a few of the folk adorning my scooter but are soon to be joined by a new addition..
VVC Chairman, Roger Smith, has designed and just taken delivery of these small, discreet oval VVC stickers. Two of these will be given out gratis to each club member and will be enclosed with the next issue of the JOURNAL, due out at the end of April. You can get an idea of scale below as Roger has already begun ‘stickerbombing’ his fleet..! 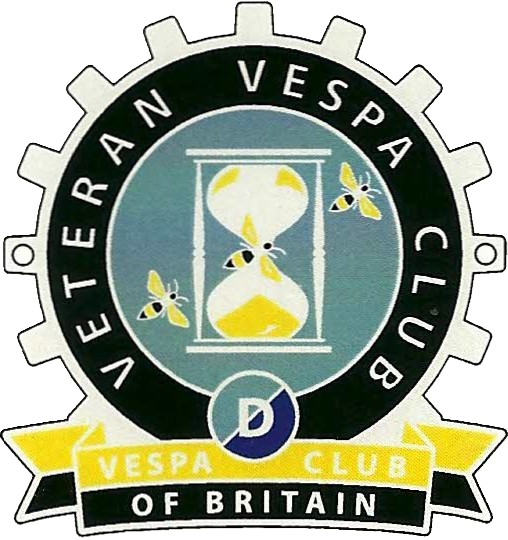 Don't forget that VVC cog badge stickers are available to buy at 50p each in the club shop.